Island hop in the Azores on this self-guided walking holiday. 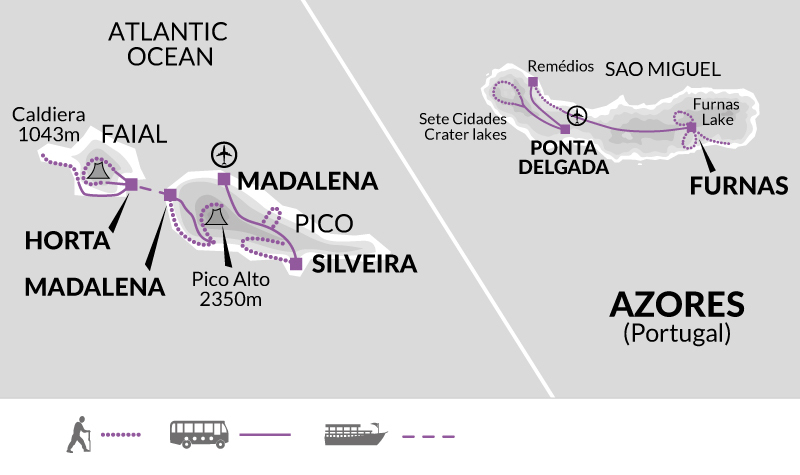 Discover three of the nine volcanic islands on a series of easy and moderate grade walks, Sao Miguel, Pico and Faial. Discover crater lakes, thermal springs, deep gorges and craggy coastlines. On arrival in Ponta Delgada, São Miguel, a private taxi will take you to your accommodation in the capital of the island and the archipelago. If you arrive early, you'll have time to explore this beautiful city by the sea. Through the city gates lies a traditional centre home to some beautiful examples of Portuguese architecture dating back to the 17th century. A whole day can easily be spent here, visiting the museums, churches and harbour to see the 3-arched city gates and the Gothic-style Church of St. Sebastian. You spend the next two nights in this beautiful capital. This morning after breakfast, you will be taken to the beginning of your first walk. Today's route follows the edge of the crater Caldeira Sete Cidades. Along the way you have views to the ocean on one side and the crater on the other, with two lakes below. A striking panorama, which originated with the explosion of an enormous volcano. The walking route ends in the village of Sete Cidades, on the shore of Lagoa Azul. Here you will be picked up by the taxi and driven back to your accommodation. Today's 12km walk is expected to take between 3.5 and 4 hours and you will ascend 130m and descend 570m. The day starts with a 30-minute private taxi to Remédios, situated in the southern part of the island near Lagoa. Your walk begins with a descent through fields, following dirt tracks to reach the source of a river or Janela. The most interesting part begins when you enter a woodland and traverse a series of tunnels and aqueducts, formerly used to supply water to the distillery in Lagoa and now used to supply water to the area. The highest point is at Janela do Inferno, a vertical wall with a small waterfall, home to newts. Then you retrace your steps back down to Remédios. Along this trail, enjoy beautiful views over the municipality of Lagoa and Ponta Delgada. Afternoon private transfer to the village of Furnas where you spend the next four nights. Approaching the village, you will smell the sulphurous aroma coming from the Caldeiras (hot springs). Furnas is know as the one of the most beautiful villages in the Azores with its white buildings, decorated churches and cosy little streets. The Terra Nostra gardens (optional) are well worth a visit to see the mix of European deciduous trees next to tropical plants, date palms and cedar and fern trees as well as the geothermal pools. Today's 9km walk is expected to take between 2.5 and 3 hours and you will ascend 250m and descend 250m. Today you will have plenty of opportunities to admire the volcanic phenomena near Furnas. At various points along the walk around Lago de Furnas, you can see steam coming out of the ground and pits where locals cook their meals. On the south side of the lake you can visit the modern visitors centre, dedicated to the restoration of natural vegetation (closed on Mondays from mid-September to mid-May). Option of ascending to the vista point at Pico do Ferro, with amazing views of the lake and valley. Tonight you could try a local speciality on the restaurant menu, Cozido nas Caldeira, a stew prepared in traditional volcanic cooking pits. Today's 12km walk is expected to take between 3 and 4 hours and you will ascend 150m and descend 380m. You will be taken to a spot just outside Furnas, on the road to Povoaçao. First you'll walk through an amazingly lush forest to reach the fishing village of Ribeira Quente, a colourful place to stop for a drink or meal. There is the option of finishing the route here on the beach or continue along the spectacular coastline through fairy-tale woodlands to Lomba do Cavaleiro. In clear weather, you will have magnificent views along the way - to Santa María island off in the distance. Today's 11km walk is expected to take between 3 and 3.5 hours and you will ascend 500m and descend 650m. Today's 35-minute transfer takes you from Furnas to Faial da Terra for a shorter but still very beautiful walk. Through a green valley, with occasional slippery sections, you traverse spectacular vegetation to reach the waterfall at Salto do Prego. From there you return to Faial da Terra, passing the abandoned ruins of the village of Sanguinho. Taxi transfer in the afternoon back to your accommodation. Today's 5km walk is expected to take 2 hours and you will ascend 330m and descend 330m. Today starts with a slightly longer transfer. Then you'll do a tough yet beautiful ascent on narrow paths, following the irrigation channels from sea level up to the 600-metre high Lago do Fogo, the most pristine crater lake in the Azores. You can choose to walk down to the lake shore, a lovely spot for a picnic or a swim. After a short ascent out of the crater, you do a long descent down a green valley back to the coast, where you can enjoy a paddle in the ocean. Here you will be picked up and taken to your accommodation for tonight, in Ponta Delgada. Today's 11km walk is expected to take 3 hours and you will ascend 480m and descend 480m. On arrival at Pico airport a private transfer will take you your hotel in Silveira, on the south of the island (about a 50-minute drive). If you have an early flight and arrive in the morning, you can spend the day by the hotel swimming pool or try your luck spotting whales from the cliff. In the morning, a taxi driver will pick you up to go to the starting point of the route, just above Silveira village. The Pico volcano, 2,351m Portugal's highest peak, will be your back drop along most of the route. The second part of this route follows mainly flat terrain as you follow the coastline back to the hotel admiring some of the southern coast of the island. Today's 13km walk is expected to take between 3.5 to 4 hours and you will ascend 100m and descend 290m. After a short 35-minute transfer, you start walking from the central plateau of Pico, an area where volcanic eruptions took place almost 500 years ago. After a while on high terrain, you begin your descent down to the north coast. You will traverse the habitat of native flora on your way to Baia das Canas. This small settlement is located on a tiny black beach. In the afternoon you will be picked up for the transfer to Silveira. Today's 10km walk is expected to take between 2.5 to 3 hours and you will ascend 100m and descend 800m. Today begins with a transfer to the start of an amazing route, from the lake at Lagoa do Capitão down to São Roque, first along red dirt tracks then downhill through a stunning forest. In order to avoid a long and demanding descent, you can choose an alternative route. Your driver will pick you up at the end of the walk and take you to your next accommodation in Madalena. Today's 10km walk is expected to take 3 hours and you will ascend 1000m and descend 770m. On your last day on the island of Pico, the taxi driver will pick you up at the hotel and drive you to the start of your walk. A straightforward route along the island's east coast, enjoying the scenery provided by Pico's historic vineyards, a UNESCO World Heritage Site. Your route ends at the harbour in Madalena, where you get the boat to Horta on the island of Faial. A taxi will pick you up at the harbour in Horta and take you to your accommodation. If you arrive on Faial in time, you can opt to do a short walk. From the marina and old fishing quarter of Porto Pim, you follow the beach out to the peninsula of Monta da Guia. The route follows quiet tarmac roads to a beautiful vista point then circles back to Horta. Today's 4.4km walk is expected to take between 1.5 hours and you will ascend 160m and descend 160m. After a 30-minute drive you arrive at the Caldeira. Two kilometres wide and 500 metres deep, it is the highest point on Faial Island and in clear weather provides splendid views of the islands of Graciosa, Sao Jorge and Pico. Today's route follows the edge of the crater, then starts downhill along a red dirt track through the forest. A levada (water channel) will guide you for a section, before the ascent to another crater Cabeço do Fogo. One last descent takes you through the Reserva Florestal de Capelo to the picnic area where the route ends. Today's 13km walk is expected to take between 3.5 to 4 hours and you will ascend 150m and descend 700m. Today you explore the west end of the island of Faial and your walking route begins in the town of Capelo. Through the green craters of Cabeço Verde and Cabeço do Canto, you will reach the young volcanic area of Capelinhos, formed by a volcanic eruption only recently (in 1957). The beautifully coloured volcanic ash is still exposed here and the young dry landscape has not yet been pushed down into the sea. The lighthouse which once marked the westernmost point of the island has not worked for years, but you can visit the lovely information centre here to learn about the history of Capelinhos or take a stroll through this newly formed terrain. You can then enjoy a coastal route to the town of Varadouro, where you will be picked up by your local representative and taken back to your hotel. 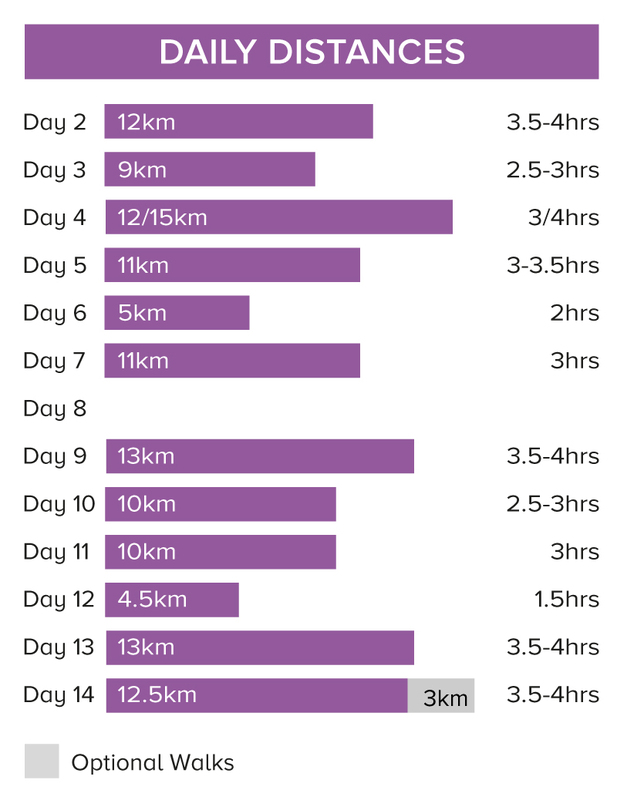 Today's 12.5km walk is expected to take 3 hours and you will ascend 300m and descend 400m. After breakfast you have an included taxi transfer to the harbour, where you get the boat back to Pico Island. From Madalena you are driven to Pico Airport where this holiday ends. July and August are the warmest months, though the islands are freshened by cooling sea breezes. Waterproofs are essential, as is a fleece for cooler mornings and evenings. Paths in forests might be muddy, so waterproof boots are highly recommended. In addition to walking boots please take with you comfortable trainers, shoes or sandals for evenings and relaxing. We suggest that on international flights you either carry your walking boots in your hand luggage or wear them - should your luggage be lost or delayed, your own boots are the one thing that will be irreplaceable. One main piece of luggage and a daypack. You will need to carry what you need for the day which may include a raincoat, jumper, camera, sun-cream, picnic lunch etc. On hot days you will carry fewer clothes but more drinking water. We recommend a waterbottle, sunhat, towel, sunscreen, repellent and sunglasses. You may find walking poles useful. If you would like to snorkel, please bring your own equipment. Sata (Azores Airlines) connects London Gatwick with Ponta Delgada via Lisbon; Ryanair with London Standsted once a week, direct. Fly into Ponta Delgada airport and out of Pico. A private transfer will take you from the airport to your hotel on arrival to Ponta Delgada. You will also need a flight from Ponta Delgada to Pico on day 8 (not included). Portugal: Visas are not required by UK, Australian, New Zealand, US and Canadian citizens. The Azores: Visas are not required by UK, Australian, New Zealand, US and Canadian citizens Other nationalities should consult their local embassy or consular office. Tue 26 Mar 2019 - Sun 28 Apr 2019 Your trip can depart anytime between the above dates. Contact us for triple room requests and solo traveller prices. Mon 29 Apr 2019 - Thu 9 May 2019 Your trip can depart anytime between the above dates. Contact us for triple room requests and solo traveller prices. Fri 10 May 2019 - Mon 30 Sep 2019 Your trip can depart anytime between the above dates. Contact us for triple room requests and solo traveller prices. Tue 1 Oct 2019 - Tue 15 Oct 2019 Your trip can depart anytime between the above dates. Contact us for triple room requests and solo traveller prices. Wed 16 Oct 2019 - Thu 24 Oct 2019 Your trip can depart anytime between the above dates. Contact us for triple room requests and solo traveller prices.